If you're buying a tankless water heater for the first time, and you have natural gas at your location, you'll probably want to go with a natural gas unit. They have the most similarities to a traditional water tank heating system, and on the whole, they're stronger and longer-lasting than electric models. But what if you aren't sure which natural gas unit is the right one for you? What if you're having trouble finding that one model that best suits your needs? Is there any tankless water heater that a trained specialist like myself would recommend to anyone? Let's talk about the Rheem RTG-84XLN. The RTG-84XLN offers 8.4 gallons per minute (GPM). This is enough to handle multiple showers and sinks at the same time. It's called "simultaneous usage" in industry slang, and it's a good thing to have. In terms of power, the RTG-84XLN can require up to 180,000 BTUs. It has an energy efficiency of 0.82. These figures are on par with other natural gas tankless water heaters on the market. Another number you should consider is the weight of the unit. Where can it be installed? How heavy is it to mount on walls and exteriors? The RTG-84XLN clocks in at 54 pounds, so you won't have a problem getting it up and off the floor. You can stick it anywhere outside that's strong enough to support it. 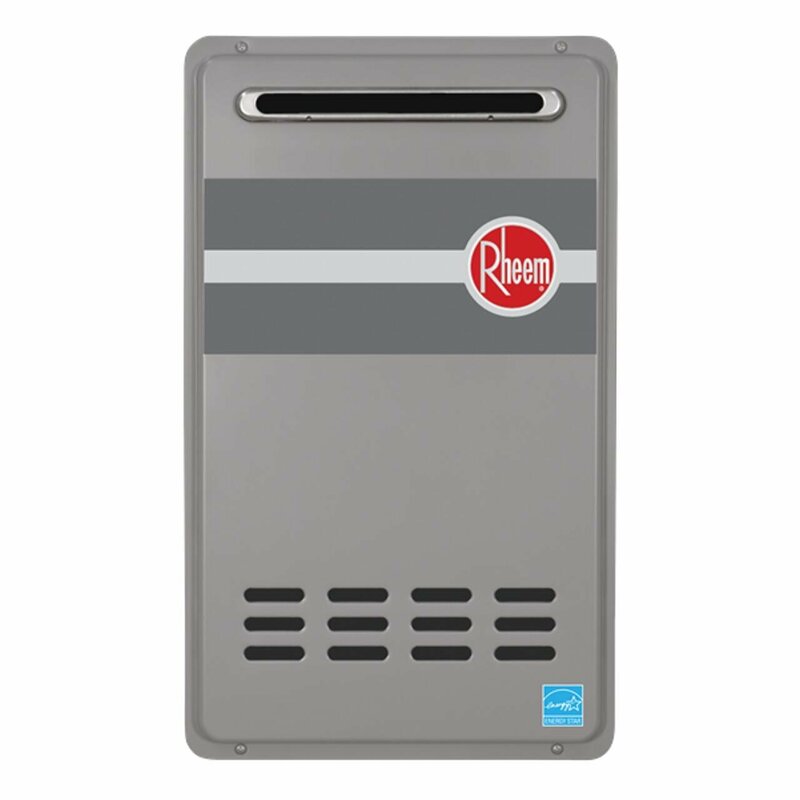 If you've been eyeballing other Rheem products, you may have noticed certain similarities between this unit and their propane ones. While both types do have the same functions and features, their difference lies in the way they make and pump emissions. The RTG-84XLN is a methane unit. As for actually venting these fumes, the RTG-84XLN comes with a special "low NOx" function that eliminates the need for complicated venting systems. Instead of requiring a fancy and expensive category III stainless steel vent, you can get by with the cheaper PVC variety. There simply won't be that many dangerous fumes that need venting. Please note, however, that you will need to install the RTG-64XLN outdoors. Installing it in an enclosed space will cause the fumes to build up in the trapped air, and that can pose a health risk to anyone who breathes them in. As previously discussed, the RTG-84XLN can deliver up to 8.4 GPM. Your exact rate will depend on where you live and how cold your incoming water is. For example, if your home is located in an especially snowy climate where your tankless water heater will have to work double-time to heat your taps, your flow rate might slow to 5-6 GPM. You should also know that the RTG-84XLN has a minimum flow rate requirement of .26 GPM. This means that your unit won't start working until the flow rate is at least .26 GPM. Temperature-wise, you're all set with the RTG-84XLN. You can adjust it manually or with a remote controller to get the exact degree you want. It's my professional opinion that a trained technician should always install tankless water heaters, especially if you're making the switch from a traditional water tank for the first time, and if you want to ensure you keep the warranty intact. If you insist on doing it yourself, however, you should find it relatively simple. Rheem includes a detailed instruction guide with every order, and they also throw in basic components like temperature wire for free. Even the best products have drawbacks. If you're serious about making a smart, well-informed purchase decision, you'll need to consider the advantages and disadvantages of the RTG-64XLN. If I had to rank the RTG-64XLN, I'd give it four out of five stars. While it isn't a perfect unit, it'll definitely deliver enough power to satisfy most customers, and it comes with extra eco-friendly properties to boot. If you're looking for a tankless water heater that will spell good things for your life and your wallet, check out the RTG-64XLN﻿﻿ on Amazon.